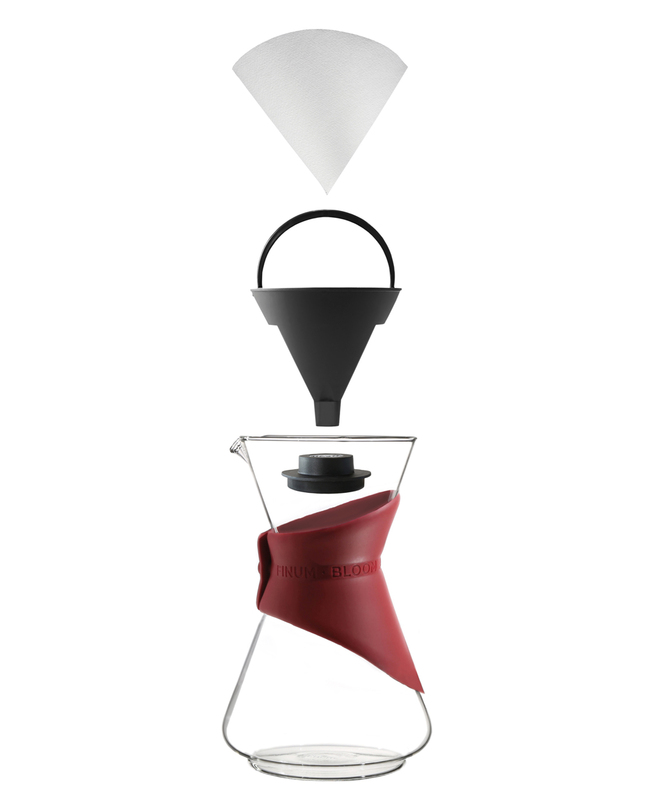 The new pour-over coffee brewer consists of a stylish glass carafe and a unique funnel insert which provides an optimized bloom and flow of your coffee through the paper cone. Made in Germany with machine blown borosilicate glass for improved thermal properties,the BLOOM AND FLOW™carafe can be placed with liquid inside on a stove or over an open flame; it is also microwave-safe. 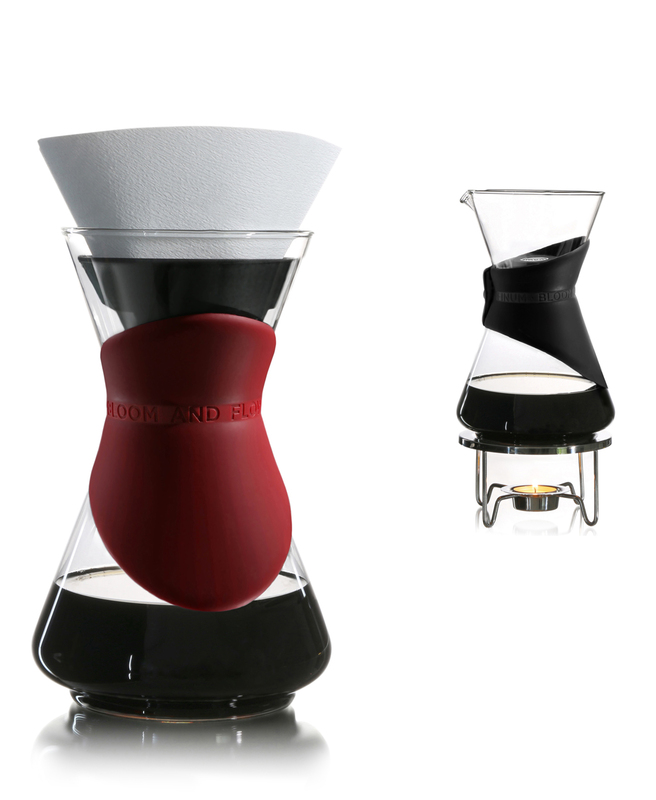 The silicone collar is soft to the touch and is available in red or black, matching the colors of our coffee grinder. To keep your coffee warm, BLOOM ANDFLOW™ comes with a lid that replaces the funnel after brewing. Additionally, the finum® COFFEE WARMER matches the BLOOM AND FLOW™. 1. 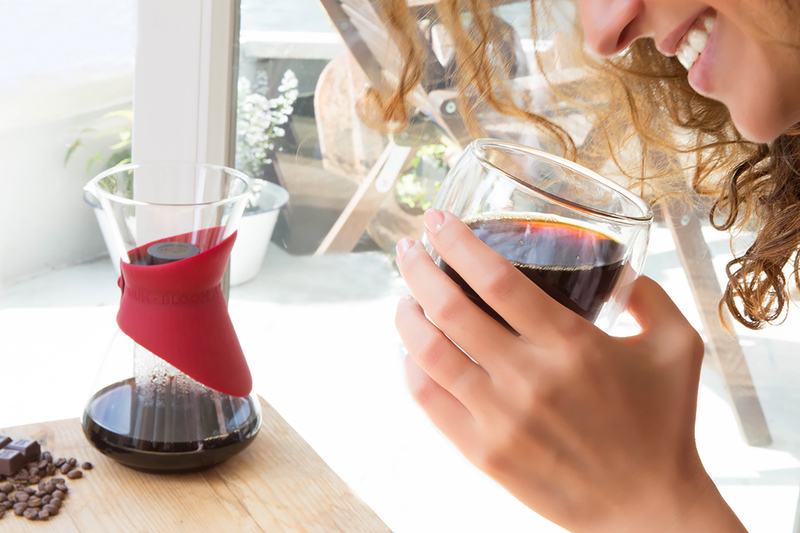 Choose a v-type paper cone suitablefor 2–5 cups of brew. For a perfect fit, fold the paper cone laterally and insert it into the funnel. 4. Weigh out 10 g per cup (20–50 g).Ground should be coarse in size. 7. Flow stage: Pour hot water in a slow spiral motion. For up to 3 cups: Keep water level no more than 1 inch above the coffee bed until you reach 415 ml~ 415 g. For up to 5 cups: Keep water level 1 inch below the rim until you reach 710 ml ~ 710 g. If the brewing time exceeds a four minute time limit, simply remove the funnel by its handle and place the funnel in a separate cup to finish straining through. By keeping your brew time under four minutes, your coffee will remain well balanced and will avoid any bitter side tastes that may occur from over extraction. 9. Dispose the used filter by removing the funnel by the handle and enjoy a perfectly balanced coffee! Place the lid inside the carafe to trap in the heat.